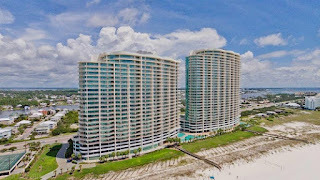 Orange Beach Alabama Beachfront Vacation Rental, Turquoise Place Resort. 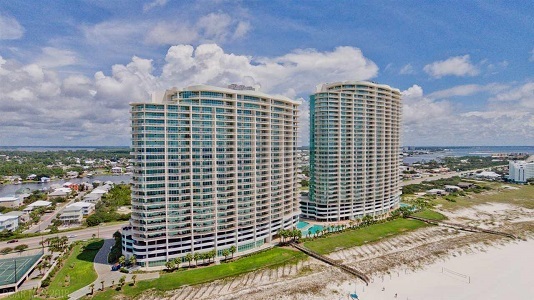 At this beautiful beachfront vacation at Turquoise Place Condos in Orange Beach, you will find beautiful furnishings that are comfortable and relaxing. The supersized master bedroom overlooks the Gulf of Mexico through towering floor to ceiling glass windows and doors! You can also access the gulf front deck from the master suite. A king sized bed is found in the master suite along with the largest jetted tub ever and a separate walk in shower. The living room area also has gorgeous views of the Gulf of Mexico and sugar white beaches through floor to ceiling glass windows and doors. Plenty of comfortable seating is found here plus a large flat screen TV. The dining room seats up to 8 people and 5 additional seats can be found at the kitchen bar. The kitchen features everything you need to cook and serve wonderful homemade beach meals.